The church in Kilbride was built during the 18th century. The wall of the original church can be seen in the garden near the post office. After a 98 year period, it was rebuilt and roofed by the MacDaniels of Bonabroka and the Kanes of Ballynameesda. It is a beautiful church that has had an active worshipping community for many years. As part of a recent renovation project, the interior of the church has been repainted and is well maintained by local volunteers. The sacraments are celebrated on a weekly basis. 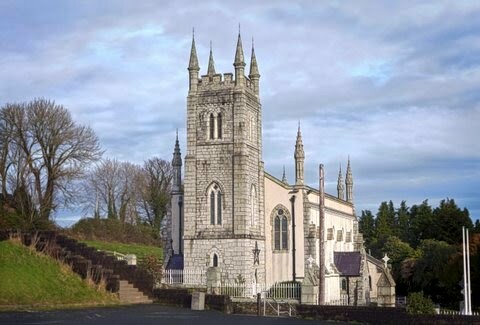 The church of St. Mary's in Balinacor is located just off the main Wexford/Dublin Road. The piers of the entrance gate to the parochial house bear an inscription that informs us that this chapel was built in the year of our Lord 1793 by the Rev. Joseph Purcell and by the subscriptions of the public. The piece of ground was a donation from Robert Byrne, Esq., to the in habitants of the Parish for ever, gratis. The inscription reads as follows, “This church was built in the year 1880 by public subscriptions by the Rev. Michael Moloney, Parish Priest A.M.D.G." The Intel over the east door of the nave bears the inscription. “ This Church was built by the Rev. Michael Moloney P.P. and dedicated by Cardinal McCabe June 6th 1880.” Fr. Moloney made sure that his name would be preserved for posterity but it is an exaggeration to say that he built the church. His achievement was more to embellish than to build what had already been there for some 87 years. The Nave is divided into five bays and is pierced by lancet windows under an enclosing arch. Externally these bays are formed by massive intermediate buttresses, with weatherings and canopies of cut stone. The Chancel was elongated to proper proportions consisting of two bays with mullioned and traceried window at the side and a stained glass window at the end, surmounting the high altar with elaborate and finely wrought cut stone foliated tracery. The window as the work of Michaek Hubert Schmitz of Aix-la-chapelle. The high alatr of Caen stone with coloured marble enrichments was presented by Fr Moloney. The elaborate groining of the stucco ceiling and the clustered columns both of the nave and chancel is a characteristic feature of those times. Probably the most remarkable feature of the church and one which is unusual in rural churches throughout Ireland, is the amount of work devoted to its exterior decoration. Parapets were raised along each of the side walls with massive cut stone coping continued on the gables each of which was finished with a granite cross, grouped buttresses was introduced affording solidity and strength rising upwards in gradual stages of cut stone and finally uniting in elaborate pinnacles rising high above the parapet with panelled faces and canopies and tapering spires adorned with carved crochets and surmounted by delicate finials of metal. The Architect was Edward Hague while the builder was James Clarke of Wicklow. The opening and dedication ceremony was performed by his Grace Most Rev. Dr. MacCabe Archbishop of Dublin on Sunday June 6th 1880. Brittas Bay Church Star of The Sea. The Star of the Sea Church in scenic Brittas Bay was officially dedicated and opened in the 1950s by the Archbishop of Dublin John Charles MeQuaid. The church celebrated the 50th Anniversary recently. In attendance to mark this wonderful occasion were Archbishop Diarmuid Martin with concelebrants Fr Vincent Dempsey PP, Fr Bertie Moore, and invited priests. Around 300 people attended the church to mark this special anniversary of this beautiful Church. Many local people and visitors came to celebrate this special day where church parishoners were proud to carry on the tradition of welcoming those who holiday in Brittas Bay every year to enjoy their holidays in the stunning surrounds. The area is well known today as a beautiful holiday spot with its caravan parks and holiday homes, a situation that has remained unchanged since the church was constructed. in the 1950s. According to Fr. Bertie Moore retired Parish Priest "In the Parish of Barndarrig there was a church at Barndarrig and a church in Kilbride, but to accommodate the visitors Mass was said in an old school and a hall attached to McDaniel's pub in the early 1950s." It was decided to construct the Star ol the Sea Church In the late 1950s to accommodate an increase in numbers over the summer season. The land was provided by A. (Sonny) McDaniel and builder of the church was Mr Cooney of Cooney Jennings, a local landowner who held property around the Magh-eramore area. Construction of the church took around 12 months to complete. The church itself is located in a very historic area, with local legend holding that St Patrick himself landed in the area below the old graveyard at Three Mile Water. The Star of the Sea Church and the parishioners are delighted to welcome people to their church and area. To cater for the large influx of vistitors during the summer months a second Mass is said throughout July and August to cater for the busy holiday period. Mass is normally celebrated every Saturday evening at 7pm and 10am every Sunday throughout the year. After the 1950s and 1960s there were a lot of people who had holiday homes and some have now been coming for two generations. Today the church is a thriving community with parishioners proud of their church and surroundings. The church is maintained and kept beautiful by an army of volunteers to which we are most grateful. The Star of the Sea Church has celebrated a wonderful 50 years and here is looking forward to many happy years ahead for a beautiful church which is an important part of the local community.